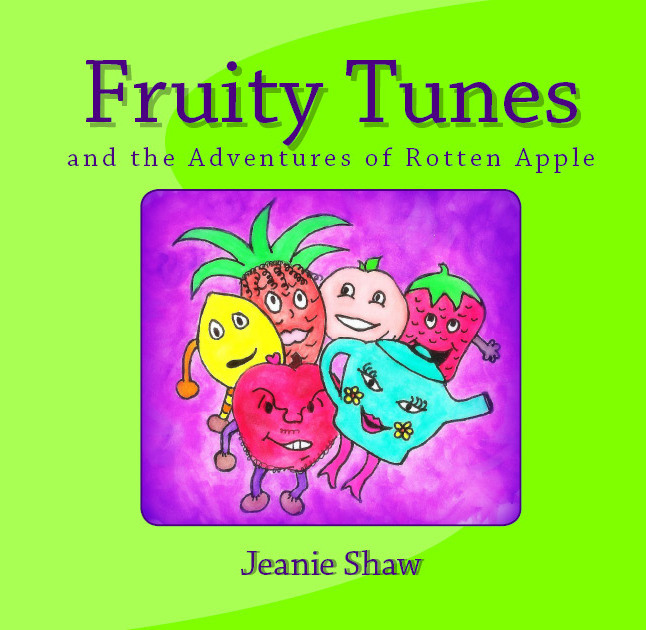 I currently have three “grandchildren and elementary school class approved” books for children–Fruity Tunes and the Adventures of Rotten Apple, Rosie and Opal: Finding Hope, and The Helping Garden. Proceeds from these books go to support numerous causes. Read about each one and order for your children! Several years ago my church was having a large gathering of several thousand people. We had limited space for children’s classes and needed to combine several hundred preschool children and teach them for an hour (or so.) As often happens, necessity is the mother of invention. Thus, the Fruity Tunes story was born. Through props, songs, Bible verses and a story of good overcoming evil (stories for kids often need a villain, right?) this little story started to come alive. I tested the story/play with my grandchildren – and they loved it. I believe children are so eager to learn. After recruiting some high school and college students with lots of energy, great voices and a shining example we were able to teach and entertain hundreds of children. The story was so well received that I decided to put it in a book. This book is particularly designed for children ages 3 to 10. You can order ($8) from me at shaw.jeanie@gmail.com or from amazon.com. Proceeds help some of the orphans I met in Romania. This little children’s book is based on a true story. I wrote this after an inspiring visit to “Hope Elephants”. The relationship between Rosie, Opal and Dr. Jim is sure to touch your heart. You can read more about Rosie, Opal and Dr. Laurita at hopeelephants.org. Recently, Dr. Jim Laurita tragically lost his life due to an accident. He had devoted his profession to the care of “his girls”—Rosie and Opal, and to furthering education about the nearing extinction of Asian elephants. Each year, over thirty thousand elephants are killed for their ivory tusks. This book has been “test read” with many children. The first reading, to a group of about sixty kindergartners at a public school, was met with keen attentiven ess, smiles, laughter, and great feedback on lessons learned. Order from me at shaw.jeanie@gmail.com or from amazon.com. This book was inspired by my hairdresser, who began offering (free of charge) her services to those who had lost jobs. She continues to do this on her day off. This little story communicates a story of love and sharing resulting from this “snowball-effect-grass-roots-helping-one- another” initiative. It will help children better understand the importance of finding ways to help others. After her beloved bookstore is torn down, Maria thinks of ways to help those affected by the loss. She plants special seeds in the dirt where the bookstore once stood. As she plants these “helping seeds,” one by one her friends begin helping others. Soon, something extraordinary happens in the lot where the bookstore once stood…bringing joy to the entire town.